Pierre started his education in Montreal. He received two bachelor degrees in arts and then sciences with great distinction, then completed an M.Sc. from McGill University in High Energy Physics (1974). Pierre received his Ph.D. from Harvard University (1980) in High Energy Physics, under the supervision of Prof. Sheldon Lee Glashow, the 1979 Nobel Physics Prize winner. Pierre started his career as a talented theoretical physicist (1972-1992) teaching at McGill University, at the Université de Moncton and then at University of New Brunswick. He returned to Montreal where 1992-1994 was an invited researcher at the Nuclear physics department of Universite de Montreal. In 1993 Pierre entered the domain of Data/Information Fusion which he vigorously pursued until his unfortunate death in 2014. He was a senior researcher at LM Canada (1993-2004), then senior defence scientist at Defense Research and Development Canada (DRDC)-Valcartier (2005-2014). He continued to work with the academia: Adjunct professor in the Department of Electrical Engineering of Universite Laval and McMaster University; and Associate member of the Centre de RecherchesMathematiques de Universite de Montreal. 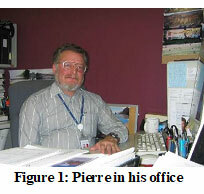 Throughout his life, Pierre aimed to be the best he can be in the domains of research he chose to be involved in, continuing to contribute in theoretical physics, as well as establishing a reputation of a very strong researcher in data/information fusion. Outside of work, Pierre was a great lover of nature and was a very social person. 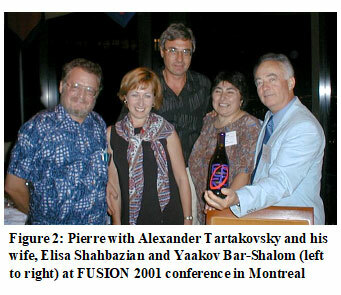 Pierre's contributions to the fusion community were significant both in the area of advancements in algorithms and approaches as well as promoting the research activities within the International Society of Information Fusion (SISF). He has developed innovative approaches for Evidential Reasoning, Dissimilar Information and Distributed Fusion, Information Quality, Uncertainty Representation and Situation Assessment. Pierre contributed with papers in every ISIF conference from the start in 1998 until 2011, co-organized the Fusion 2001 in Montreal, and was co-chairman for Fusion 2007 in Quebec City. He was active in numerous SPIE and IEEE events, as well as a leading participant in NATO fusion activities including Research and Technology Organization (RTO) conferences, Advanced Science Institutes (ASI), and Advanced Research Workshops (ARW) - all of which he contributed to the edited volumes. As part of DRDC, he was active in The Technology Cooperation Program (TTCP) for multi-national collaborations. Among all of these international endeavors that he helped coalesce for the information fusion community, he would be best known for his role of VP membership which he held for more than a decade. He established and maintained the ISIF membership database and performed analyses and conference participation to help grow the society. Anyone visiting Pierre’s office would remember the many six-by-two foot posters he had proudly displayed of numerous ISIF conference group pictures. Pierre will be greatly missed by his friends, by everyone that knew him and the ISIF on the whole.